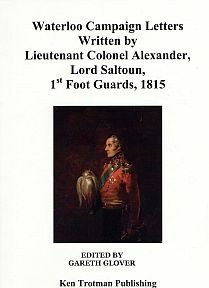 This, the latest production in my series of previously unpublished or extremely rare memoirs of the Napoleonic Wars is a particularly interesting one, being the letters of Lieutenant Colonel Alexander Fraser, Lord Saltoun, one of the most famous officers to serve at Waterloo, where he aided significantly the defence of Hougoumont. Indeed Wellington publicly described him as a pattern to the army both as a man and a soldier. But where you might ask, did I find such important material? I did not have to look far! No further in fact than Richard Brown, the owner of Ken Trotman Books, who had purchased this little copy book some years ago and wondered if it was of any use! This booklet, written in a beautiful hand, was probably copied from the original letters during the Victorian era; but no clue now exists as to the person who owned it, presumably a close family member; but they now form a fascinating glimpse of this famous officer and his adventures from Waterloo to Paris. Probably, not to cause his wife anxiety; his letter regarding the Battle of Waterloo is not very detailed, therefore I have also included the two letters that Saltoun wrote in later years to William Siborne, one of which was published by Herbert Siborne, but not fully in The Waterloo Letters, these are still held within the Siborne papers at the British Library. Alexander George Fraser, was born in London on 12 April 1785, the eldest son of Alexander, the fifteenth Lord Saltoun of Abernethy and his wife Margory, daughter and heiress of Simon Fraser of Ness Castle, Inverness, a director of the East India Company. He succeeded his father to the title on 13 September 1793 when still only eight years old. He was educated at Eton and was reputedly the first boy ever to jump into the Thames from Windsor Bridge. Alexander joined the army at a relatively late age for the time; being fully seventeen when he joined the 91st (Argyllshire Highlanders) Regiment of Foot as an ensign (by purchase) on 28 April 1802; in which regiment his uncle, Major General Duncan Campbell of Lochnell was colonel. He rapidly rose to the rank of lieutenant by purchase in the 2nd Battalion 35th (Sussex) Regiment of Foot, commanded by his friend General Henry Fletcher of Saltoun on 2 September 1802 but was placed on half pay when the battalion was reduced in May 1803. However, with the resumption of war, he exchanged to a lieutenancy in the 42nd Highlanders and was made captain on 7 September 1804. On 23 November 1804, Alexander exchanged into the 3rd Battalion 1st Foot Guards (not to be known as Grenadier Guards until 1815), and accompanied them to Sicily, where they languished until returning to Britain in December 1807. Saltoun served with the light company of the 3rd Battalion when it sailed with General Sir David Bairds force in September 1808 to reinforce the army of Sir John Moore. Landing at Corunna, they marched to Mayorga; only to be forced to retreat all the way to Corunna where he fought in the battle commanding his light company. His battalion next fought in the ill fated Walcheren campaign and he carried the remnants of the fever throughout the rest of his life. Early in 1811 he was sent to Cadiz to participate in the defence of the city, relieving the 2nd Battalion. In late 1812 he joined the 1st Battalion at Burgos and commanded the light infantry company of that battalion at Vitoria, Sorauren, the Bidassoa, Nivelle, Nive and the sortie from Bayonne; which formed a tragic finale to the war. Saltoun had been promoted to captain and lieutenant colonel in the 3rd Battalion on 25 December 1813; he however successfully applied to remain with the army in Southern France and only returned to England in 1814 once peace was established. On 6 March 1815 Saltoun married Catherine Thurlow, whom he had met three years earlier whilst on leave, natural daughter (he never married) of Lord Chancellor Edward Thurlow, 1st Baron Thurlow (1731-1806); but by May 1815 was ordered on service again, following the news that Napoleon was again at large. The 2nd Battalion was already in Belgium; initially the 1st Battalion was ordered to join them, but Colonel Upton had just been appointed Military Attache to Bavaria and not wanting to lose this opportunity, used his influence to get the 3rd Battalion sent instead. The 3rd Battalion marched from Birdcage Walk at 6a.m. on 5 April, embarked onboard transports on 9 June, landed the following day at Ostend and were billeted at Marc near Enghien by 14 April. Saltoun joined the 3rd Battalion, which had preceded him, near Enghien on 26 April and on 15 May was placed in command of the light companies of the Guards Brigade. All remained quiet until 2 a.m. on 15 June, when the regiment was roused and marched at 4 a.m. He was engaged with his regiment in the wood at Quatre Bras after a twenty-six mile march. It is recorded that before entering Bossu wood, Saltoun was met by the Prince of Orange who ordered the light companies to drive the enemy out of the woods. Not perceiving the enemy, Saltoun asked where the enemy was. The prince, mistaking this for hesitation, replied hastily Sir, if you don’t like to undertake it, I’ll find someone . Saltoun calmly and quite unperturbed repeated his question; and on their location being pointed out to him, formed his line of skirmishers and led the attack. Later on the battalion advanced into the wood but in the inevitable confusion, ended up firing upon their own light troops in advance; causing Saltoun to send Lieutenant Ellis back to stop them firing on his men. The losses of the two battalions at Quatre Bras added up to 6 officers killed and 8 wounded; 43 men killed and 491 wounded; in all 548 casualties from a total of about 2,000 men who had marched from Enghien that morning; a full 25%. Hamilton states that Lord James Hay, who was killed this day, was acting as adjutant to Lord Saltoun, mounted on a very fine horse; in its excitement at being put at a fence it refused, reared and tried to wheel around. As Saltoun was proceeding down a pat, after passing through the Wood of Bossu, a body fell across his horse’s neck and rolled off. It was that of Lord James Hay who had just been shot by a cavalry skirmisher, who was in his turn shot by a guardsman close to Saltoun. At the Battle of Waterloo, Saltoun was initially placed in the orchard and woods but was relieved by Nassau troops; he then marched his men back to the battalion on the crest. As he approached the ridge the Duke enquired Hallo, who are you? Where are you going? , whereupon Saltoun restated his orders. The duke was surprised and replied Well, I was not aware of such an order; but however don’t join the brigade yet; remain quiet here where you are until further orders from me. Several hours later, as the battle commenced, an aide de camp rode up ordering him back to the battalion. However no sooner had they arrived there than the order came Light infantry to the frontand Saltoun took his men back to the orchard where they played a leading part in the defence of the wood and orchard, but did eventually return to the crest again. During a lull in the fighting in the evening it is reported that Wellington and his Staff were close to the battalion and Wellington was heard to say Well, I think they are pretty well told out now. Saltoun who was nearby boldly interjected to one of the Staff I don’t know; I was outside the wood at Hougoumont this morning, before the action began, I watched a column of men, as far as I can guess about 5,000 or 6,000, go into a hollow opposite. I have kept my eye on this spot all day. And have never seen them come out yet. When this was repeated to the duke, he turned his spy glass in that direction and exclaimed By God! He is right; they are coming out now . This was the advance of the Imperial Guard. It is also claimed that Cambronne surrendered to Saltoun and handed him his sword; this is of course at variance with the claim of Halkett to have captured this infamous officer. Lord Saltoun lost two horses during the battle and received a ball through his shako; his blanket roll, when removed from his horse after the battle was found to hold seventeen musket balls in its folds! The two battalions at Waterloo lost 4 officers, 2 sergeants and 129 men killed; 11 officers, 14 sergeants and 327 men wounded; interestingly this was slightly less than the casualties at Quatre Bras, but did equate to over 30% of its remaining numbers.